Director of Medical Education, Assam Admission Notice 2017- For B.Sc. Nursing and Diploma in Pharmacy Courses. - Jobs4NE : Jobs in Assam and North East India. 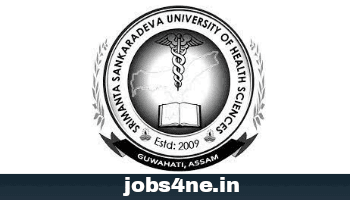 Director of Medical Education, Assam Admission Notice 2017- For B.Sc. Nursing and Diploma in Pharmacy Courses. Application Forms for Common Entrance Examination for selection of candidates for admission into both 1st year B.Sc. Nursing and Diploma in Pharmacy courses in the institutes under the Director of Medical Education, Assam for the session 2017 shall be issued from 25.05.2017 to 05.06.2017 at the Office of the Principal, Assam Medical College, Dibrugarh / Gauhati Medical College, Guwahati / Silchar Medical College, Silchar / Jorhat Medical College, Jorhat / Fakhruddin Ali Ahmed Medical College, Barpeta / Tezpur Medical College, Tezpur/Regional College of Nursing, Guwahati. Application Fee: A non-refundable amount of Rs. 50/- (Rupees Fifty only) in the form of Bank Draft/Banker’s Cheque drawn in favour of “Srimanta Sankaradeva University of Health Sciences” payable at “SBI, GMC Branch, Guwahati” during office hours. Last Date: The last date of submission of filled in Application Form is 05.06.2017 (up to 5:00 PM). Late Fee: Application Forms may be submitted directly at Srimanta Sankaradeva University of Health Sciences, Narakasur Hilltop, Bhangagarh, Guwahati on 6th June, 2017 (after the last date of submission in the Colleges) during office hours along with a late fine of Rs. 200.00 (Rupees Two Hundred only) in the form of an additional Banker’s Cheque/ Demand Draft drawn in favour of “Srimanta Sankaradeva University of Health Sciences” payable at “SBI, GMC Branch, Guwahati”. Application Form, if sent through Post or Courier, should reach the office before closing time and date. Application received after closing date and time shall not be considered under any circumstances. Entrance Test: The Entrance Test is going to be held on 2nd July, 2017 at Guwahati, Dibrugarh, Silchar, Jorhat, Barpeta and Tezpur. Details of the Entrance Examination including eligibility criteria and requirements shall be available at the University website: http://www.ssuhs.in. Admit Card: Admit Cards will be issued from the Office of the Principal, Assam Medical College, Dibrugarh, Gauhati Medical College, Guwahati, Silchar Medical College, Silchar, Jorhat Medical College, Jorhat, Fakhruddin Ali Ahmed Medical College, Barpeta, Tezpur Medical College, Tezpur and Regional College of Nursing, Guwahati on 27th and 28th June, 2017 during office hours as per the Examination Centre of choice mentioned in the Application Form. No duplicate Admit Card shall be issued from any other College. Applicants are therefore informed to collect their Admit Cards only from the Office of the Principal of College of the Examination Centre of their choice. In case they are unable to collect the Admit Card themselves, Admit Card will be issued only to persons duly authorized by the candidate in writing on the date and time mentioned above. Examination Fee: An Examination Fee of Rs 1000/- (Rupees One thousand only) will have to be paid at the time of submission of Application Form in form of Bank Draft/ Banker’s Cheque drawn in favour of “Srimanta Sankaradeva University of Health Sciences” payable at “SBI, GMC Branch, Guwahati”.